A widening chorus of literary voices from the Arab world is being heard on the international stage, thanks in part to the leadership of the UAE’s Sheikh Zayed Book award, says Lebanon’s Nasser Jarrous. With an introduction from the Shiekh Zayed Book Award director Mouza Al Shamsi, the London Book Fair and the Abu Dhabi Department of Culture and Tourism stand (7H39) welcomed one of Arab literature’s best-known ambassadors today (March 13), Nasser Jarrous, to a discussion moderated by Publishing Perspectives on where things are in the presentation of strong Arabic literature to the rest of the world’s markets. As Publishing Perspectives readers know, the Sheikh Zayed Book Award is among the world’s richest and most prestigious literary prizes, and the program has announced its shortlists for the 2019 season drawn from a total 117 titles longlisted in the program’s nine categories, and from 382 initial nominations. At stake is a purse of 750,000 United Arab Emirates dirhams (US$204,176) in each of eight book categories. The Cultural Personality of the Year carries an award of 1 million dirhams (US$272,235). In every case, a winner is also given a gold medal with the award program’s logo and a certificate of merit. Al Shamsi established in her welcoming introductory remarks, some of the most thoughtful and at times challenging cultural context in the Arab world today can be found today in the literary leadership being defined by the Sheikh Zayed Book Award with its comprehensive list of categories including literary fiction, children’s literature, literary and art criticism, publishing and technology, the work of younger authors, international relations, and translation. In many cases, in fact, translation funding is made available by the program to encourage international publishers to consider and publish the honorees of the prize—this to help move the myriad voices of the Arab world’s literary range into the mainstream of world literature where they belong. Based in Beirut—and long known not only for his publishing acumen based in the publishing venture his father founded but also for serving as a valued emissary for Arab literary culture to the rest of the world—Jarrous said today, “The Sheikh Zayed Book Award has provided the crucial opportunity for Arab literature to be known better.” Too many talents from the region still would be unknown, he said, without the respect that the award both carries in its international outreach and conveys on its nominees and laureates. Among challenges the region’s industry faces, he said, are censorship in some areas and piracy. 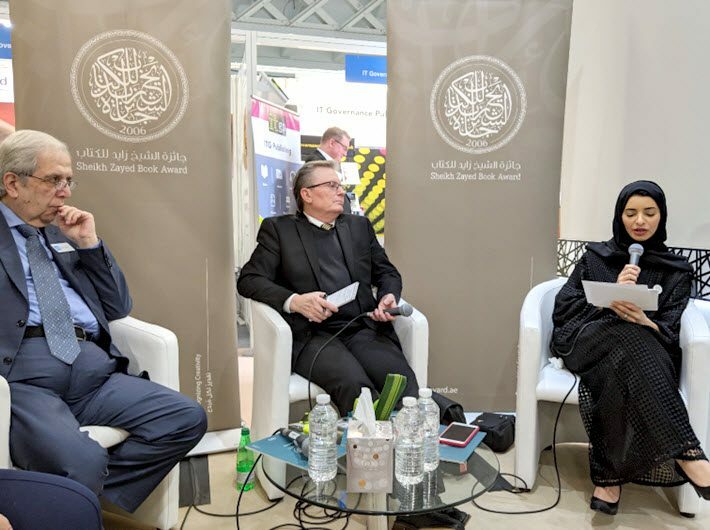 Needless to say, the Zayed Award’s devotion to the freedom to publish, as championed by the International Publishers Association, can serve as a kind of answer to local censorship, raising the value of courageous literature to the world’s attention. Another, stubborn problem Jarrous pointed to is piracy, quite robust in many parts of the world, and something with which he’d like to see the government engage more forcefully with copyright protection enforcement. But a bright spot, he told the audience today, with Al Shamsi’s agreement, is the presence of many talented women authors working in the region. Their work is being spotted and appreciated by the many jurors of the Zayed program. And Al Shamsi, herself, is known as prominent woman in the public sector, bringing more than a decade of leadership in cultural development when she took on the role of the Zayed directorship in 2017. Perhaps most critical of all, Nasser Jarrous said, is instilling the habit of reading in young people of the region, a goal the Zayed serves both in its recognition of children’s literature and of the work of young authors. He came back to the concept of what he sees as a kind of renaissance, a revolution as he calls it in Arab literature—with the Sheikh Zayed Book Award, now almost a decade into its work, as a critical partner in the progress being made. The annual award program for the Sheikh Zayed Book Award is set for April 25, again at Abu Dhabi’s Manarat Al Saadiyat. More from Publishing Perspectives on the Sheikh Zayed Book Award is here, more on Arabic literature is here, and more on translation is here. 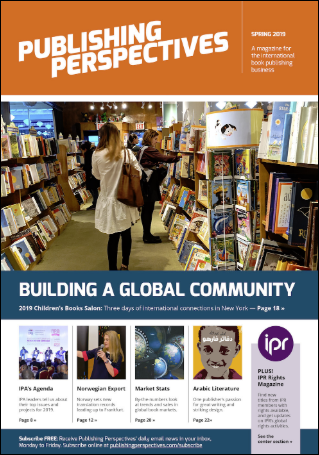 Our Spring Magazine also includes more coverage of the Sheikh Zayed Book Award, including our interview with Scientific Committee member Paula Santillán Grimm, and it’s ready for your free download during the London Book Fair—where you’ll find the print edition available, also free of charge.